My friend Lis is moving home soon. She’s been in Montreal for a million years getting all corporate: wearing power suits, making sales, skiing in the Laurentians, becoming the kind of person I admire and envy while I become the kind of bohemian flailer she admires and envies. I do suspect the grass is greener on the corporate side. Downright manicured, even. But that’s how perception works. It fools you into thinking you’re less awesome than you are. Lis was the friend you lived with in your twenties, in a one bedroom apartment, who slept on the floor in the living room. Her student loan hadn’t come in, and she was just going to crash for a few weeks, but you didn’t want her to leave. So she stayed, and every morning, with a cup of coffee in hand, you tripped over her prostrate figure on the way to the futon to light your first cigarette of the day. By the time you got around to packing the first bowl of the day, she would come to, mutter something about just needing five more minutes. She’d take a swig of Coke from the two litre bottle she kept next to the bed, close her eyes, and wait for the caffeine/ sugar to take effect. When it did, she’d join you in your wake and bake. Then, after another smoke and an Italian shower (douse yourselves in perfume) you’d drive out to somewhere nice: the waterfront or Sooke potholes or Metchosin, to be outside. You’d bring beer. She’d have impractical shoes. You’d talk about stuff you were writing, and plays you’d both read. She’d tell stories so beloved, you’d ask for them by name. “Tell me Don’t Drink The Bong Water, Lis!” She’d always seem surprised you wanted to hear it again. The details may be different, but I hope you’ve all had a friend like this. 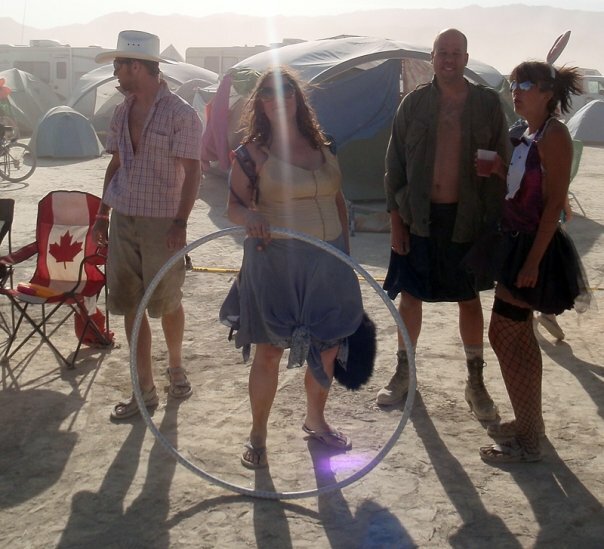 Lis and I lost touch after university and then found each other again at Burning Man. Twenty thousand people, and she was camped right across from me. This is the kind of thing that happens there, there’s a Burning Man saying: the playa provides. The playa gave me Lis. Lis is the friend you re-connect with in your early thirties, who takes you out into the deep empty playa and when a sandstorm blows up, tells you to keep walking. You know how dangerous this is, there are crazy vehicles ripping around everywhere: two storey giant birthday cakes and steampunk attack snails, and you can’t see two feet ahead of you. Lis tells you to keep walking. You’re pissed off, but you keep walking. The sand abrades your exposed skin, but you keep walking. And then some dubstep wafts in from somewhere unseen and you and Lis start dancing, slow-mo dancing into the unknown. You’re wearing a princess crinoline and motorcycle goggles and bunny ears and a Darth Vader chest piece over a silver bikini and you think “Thank god I’m here, doing this, right now.” The knot in your chest, the one you started feeding with your control issues when you turned thirty, unwinds. And you know you wouldn’t be doing this at all without Lis. Your own details are definitely different, but you know what I mean. That kind of friend. But a lot of this stuff happened a long time ago, and we’re not the same people, and that’s probably for the best. So now Lis and I get to forge a different kind of friendship. One that’s based on healthier, less destructive adult stuff, I suppose. It’s more in my nature to tell stories about the “good” old days, but Lis likes to look ahead. And she downplays all the lessons she’s taught me, and all the good she’s responsible for. That’s okay, I won’t forget. That’s how good friendship ages. This entry was posted in Blah Blah Blah, Non fiction on May 17, 2014 by carleigh baker.